With the weather getting colder, and colds and flu bugs starting to pop-up, I always want to make sure I’m reducing my exposure to getting sick. One of the easiest ways to do this is to make sure I’m keeping my hands clean and not carrying around germs, so I always keep a package of anti-bacterial hand-wipes at my desk. I ran out earlier this week, so I wanted to snag a new canister when I was at Walmart. I usually get the Wet Ones brand, but saw an Equate version sitting right next to them. I’m always curious to try out the store brand, and so I snagged a bottle of each so that our team could test them side-by-side. The first thing we noticed was the difference in packaging. Usually the name brand has more sturdy packaging, but in this case the Wet Ones canister opened with a somewhat flimsy flap, while the Equate version had a more sturdy cap with a wider opening. However, the wider opening made it harder to pull just one hand wipe out at a time, while the Wet Ones came out one at a time and were easily torn from the sheet. Ingredient wise, the two had very different formulations. Wet Ones active ingredient was Benzethonium Chloride, at 0.3% of the chemical formulation. Equate, on the other hand, utilizes Bezalkonium Chloride. These two compounds are very similar anti-microbial agents, and are often used more or less interchangeably. However, the inactive ingredients are significantly different as well. These wipes perform a similar function, but the “compare to” tag here feels a bit disingenuous. Scent-wise, both featured a citrus smell. Our testers preferred the Wet Ones scent, but neither was off-putting. 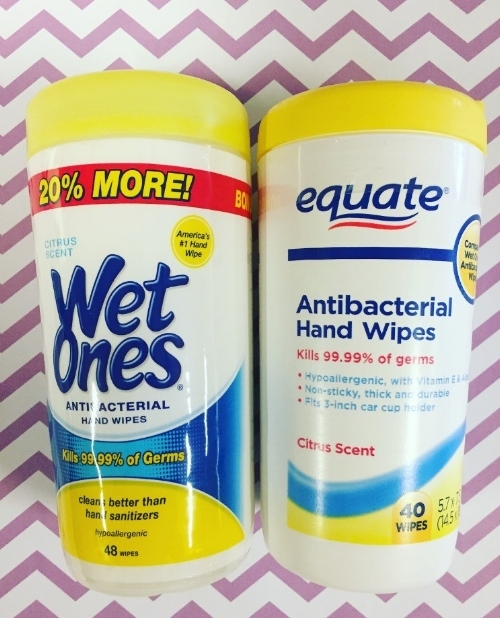 Both types of wipes were about the same thickness, and held up well under our use tests. Neither left a noticeable residue. Overlal similarity score: 63.7%. This is based primarily on the different ingredient formulations. Also worth noting was the negligible price difference. Equate was only 25 cents cheaper per bottle, and the wet ones included 8 additional wipes, making it actually cheaper per unit. With such little price difference and a different formulation, we don’t recommend sticking with the name brand. If you enjoyed this information, sign up for our monthly newsletter to get more great product comparisons, updates to the site, and information about our upcoming app beta.